Hello, loves! Can you tell I stole yet another item from my boyfriend's closet? 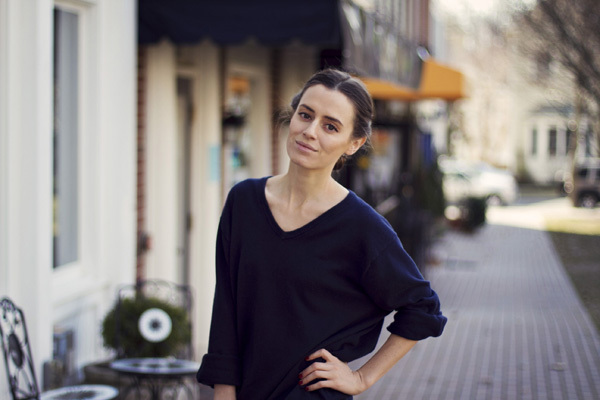 This J.Crew V-neck sweater is perfectly slouchy and soft, and I love wearing it for cozy breakfasts as well as for running errands. Life has been so busy in a best way possible, and I couldn't be happier. Can't devote much time to blogging though but I'll try to keep you updated. Plus I'm beyond excited about the gorgeous spring weather that has finally arrived -- sunshine, 70F and blossoms everywhere. As I'm writing this post, the door to our patio is wide open and I can hear the birds chirping their silly songs. Welcome, Spring! We've been waiting for you. this outfit is perfection! is the zara bag recent - I'm obsessed with it! Perfect sweater! I reckon the men's section always have the best sweaters in terms of "slouch", colour and material. That sweater is so gorgeous! I just love this outfit. What a beautiful sweater , it suits you so well!! Love the oversized feel to this sweater El. comfy and chic! love it! El you are so pretty. I adore your style. It is amazing how you can be so cool with basic clothes! That is a lovely outfit. And besides your outfit, I really like how you did your hair. 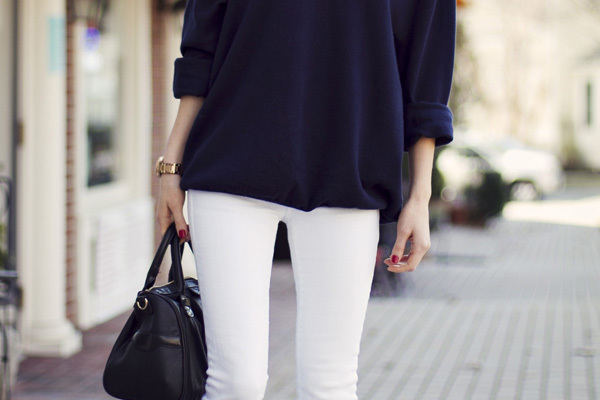 Perfect laid back outfit, I love the fit of the jumper! simple and clean outfit!LOVE IT! love it! hope he doesn't mind! Also like how you did your hair, I would appreciate a picture from behind to see how you did the bun! Такое простое, но потрясающее сочетание!!! It looks great on you!! Keep it into your wardrobe!! Mad about bf clothes! They have the best flannel shirts to tie around the waist with jeans! You do live up to your blog name, girl!!! I love the way your hair looks in these pictures!